بون, کاترین, ویلجوئن, آندره. (1391). CPUL، منظر شهری همیشه مثمر؛ رویکردی نوین به تلفیق زراعت و شهر. 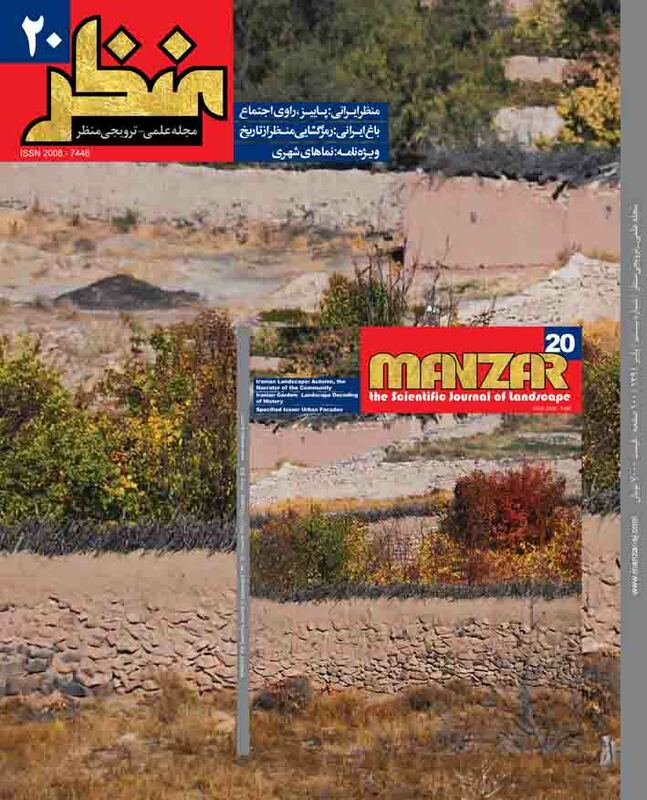 مجله علمی-ترویجی منظر, 4(20), 12-17. کاترین بون; آندره ویلجوئن. "CPUL، منظر شهری همیشه مثمر؛ رویکردی نوین به تلفیق زراعت و شهر". مجله علمی-ترویجی منظر, 4, 20, 1391, 12-17. بون, کاترین, ویلجوئن, آندره. (1391). 'CPUL، منظر شهری همیشه مثمر؛ رویکردی نوین به تلفیق زراعت و شهر', مجله علمی-ترویجی منظر, 4(20), pp. 12-17. بون, کاترین, ویلجوئن, آندره. CPUL، منظر شهری همیشه مثمر؛ رویکردی نوین به تلفیق زراعت و شهر. مجله علمی-ترویجی منظر, 1391; 4(20): 12-17. اگرچه مفهوم منظر شهری همیشه مثمر بر روی الگوی شهری اروپایی متمرکز است، اما براساس یک تجربه بین‌المللی شکل گرفته و دستاوردهای آن قابل قیاس و نیز سازگار با دیگر الگوهای شهری است. این منظر با ارایه راهکاری منسجم به، زیربنای پایداری شهری جدید را خلق کرده و به بازتعریف کاربرد فضاهای باز شهری می‌پردازد. مقاله حاضر کشاورزی شهری را به عنوان یکی از اصلی‌ترین مؤلفه‌های منظر شهری پایا مورد توجه قرار داده و به بررسی نقش منظر حاصلخیز در بستر طراحی منظر شهری همیشه مثمر می‌پردازد. امروز نمایشگاه‌های بین‌المللی و انتشارات‌ زیادی این موضوع را مورد توجه قرار داده‌اند. همچنین این مقاله تغییر قابل توجه کشاورزی شهری را از یک موضوع حاشیه‌ای به موضوعی اصلی در معماری و شهرسازی معاصر دنبال می‌کند. این نوشتار اذعان می‌کند توجه کافی به کشاورزی شهری باعث می‌شود طراحی منظر حاصلخیز اساس سیاست‌های توسعه پایه‌ریزی شود که حمایت از فعالیت‌های آن نیازمند اقدامات انتظامی، ضربتی و ماهرانه‌ای است تا بتواند از تمامی پتانسیل‌های کانسپت‌هایی منظر شهری همیشه مثمر برای ساختن زیربنای ضروری درون شهرهای پایدار آینده به درستی استفاده کند. This paper focuses on urban agriculture as one of the major components of CPUL (Continuous Productive Urban Landscape). CPUL CITY concept can make urban space more productive for the city and more desirable for its citizens and describes our vision for an urban future based on the planful physical, social and managerial introduction of continuous productive urban landscapes (CPUL) including urban agriculture into existing and emerging cities.. The goal is to improve qualities of life. The CPUL City concept proposes that urban agriculture can contribute to more sustainable and resilient food systems while also adding beneficially to the spatial quality of the urban realm. It is an environmental design strategy and provides a strategic framework for the theoretical and practical exploration of ways to implement such landscapes within contemporary urban design. Designing a CPUL means to create a qualitative urban landscape which, above all, thrieves to incorporate the growing of local and organic food. A systemic approach needs to be taken to integrate the physical CPUL / CPUL space into existing or new to establish local managerial systems, i.e. a stakeholder network and/or waste recycling and/or a water system. The CPUL City concept recognises that each city and each site will present a unique set of conditions and competing pressures informing the final shape and extent of its productive landscapes. Today, the CPUL City concept is complimented by other urban design concepts for integrating urban agriculture into contemporary Western cities. Often these start from an interest different to CPUL and result in a different set of proposals, but all have began to explore the design possibilities of growing food within the urban realm. Finally the paper concludes that, while urban agriculture is receiving a great deal of attention, the theory underpinning the design of productive landscapes and the rationale for developing policy to support its practice will require sophisticated cross-disciplinary work to articulate the full potential of concepts such as CPUL in making essential infrastructure within future sustainable cities. Concepts like Continuous Productive Urban Landscape (CPUL) and CPUL City provide design strategies capable of giving spatial and organisational coherence to the infrastructural and qualitative aspects of urban agriculture. The paper documents the growing interest in productive landscape and the CPUL concept within the fields of architecture and urbanism. To translate this interest into practice will require further cross-disciplinary work. The design, planning, landscape, horticultural and retail professions will need to relearn old and develop new skills to support, in particular, the practice of urban agriculture. If urban agriculture is to be widely adopted, its functions, in addition to environmental sustainability, such as providing urban ornament, require articulation. If the economic and social infrastructure can be put in place to support it, we could build something far more abundant and significant than that envisaged by a romantic notion of “growing your own”. Urban agriculture might then answer the fundamental question about our urban future by offering more experience with less consumption.